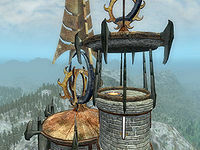 Frostcrag Spire is a tower east of Bruma that serves as a home for magic-oriented characters (download-specific). 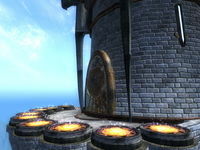 The tower is added by the Wizard's Tower official download. It can be reached by fast travel or by following an unmarked road that leads from Bruma to Cheydinhal. It becomes your property when the download is installed or when you exit the sewers after the tutorial, whichever is later. The accompanying quest is simply to buy upgrades. Without upgrading, you've basically got Cyrodiil's highest altitude alchemy garden and portals to all of the Mages Guild Halls. The tower's real benefits only become available when you can start to afford some of the upgrades (which will cost more than the base prices once haggling is taken into account). More details are available on the houses page. Description: Alchemy table that provides a +15 Fortify Alchemy enchantment. 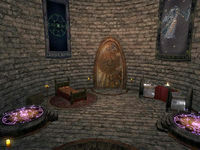 The Altar of Alchemy is located upstairs in the living area. 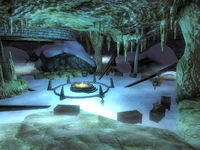 The altar was created by the spire's original owner, Taris Rendil, and Sinderion, the master alchemist of Skingrad. It grants you the ability Alchemical Brilliance, which temporarily boosts your Alchemy skill by 15 points when you are standing near it. This is the only Fortify Alchemy effect in the entire game that actually works, i.e., it really does allow you to produce more powerful potions and poisons. (The difference between this effect and all other effects is that it is implemented as an ability rather than a spell effect; abilities modify a skill's base value not just its current value). Even with Alchemical Brilliance, your maximum effective Alchemy skill level is 100 (i.e., although your skills page may say 115, the potions will be identical to those that you brew when your skills page says 100). It also grants you the next mastery perk if the buff happens to spill over (i.e., with an alchemy skill of 85, Alchemical Brilliance will raise your Alchemy skill to 100, and grant you the corresponding mastery perk). If it raises you up to or beyond 100, you will receive no experience for any potions you create. 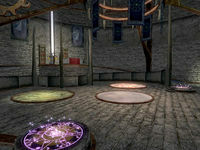 The Altar also contains Apprentice level alchemy apparatus, which can be very useful for low-level characters. In addition, a small bookshelf is added in the living area which contains a copy of A Game at Dinner, one of the Alchemy skill books. Description: A bed and better lighting, plus a chest, jewelry box and cupboard (all safe). Description: Large collection of books and their accompanying shelves, tables and stands in the main level. Purchasing the library upgrade will provide you with a large collection of books located in the main level. Description: Fills vault with containers, vault guardians, and rare wines. The vault is a nice place to store your precious equipment; it is accessed using a portal in the main room. Once you purchase the vault upgrade, it contains chests, barrels and crates (all safe) as well as a nice collection of fine wines, including 1 bottle of Surilie vintage 399, 2 bottles of Tamika vintage 399, and a bottle of Shadowbanish wine. Your treasure is guarded by seven friendly Imps known as Vault Guardians. These imps can be harvested for souls that can then be used at the Altar of Enchanting (if you are level 13 or higher they will be grand souls). They can also be looted for Imp Gall which can be used to make potions. Just like any other creature in the game they respawn after a few days, providing a convenient source of free, respawning souls. The imp you attack will defend itself, but the other imps will not help out. The Imps can be useful for those born under the Atronach to restore Magicka. Attack one, let its Spells cast upon you to utilize your absorb Magicka. They will not follow you through the portal (so you can escape in case your health gets too low), nor will they remain hostile when you return. Description: Used to activate the spellmaking and enchanting altars. 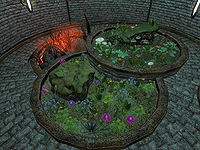 Seven Mana Bloom flowers, that provide the very rare ingredients Ambrosia (from the four reddish-purple plants) and Lichor (from the three bluish-purple plants). One Nirnroot plant. It will not grow back after it is harvested. The Oblivion flora is all domesticated, in particular the Domesticated Spiddal Stick (yielding Spiddal Stick) will not poison you, unlike the wild variety. The Harrada Root (yielding Harrada) is also all of the non-dangerous variety. However, the domestication process was apparently unable to improve the harvesting probability. As with all plants, the garden's plants will respawn. 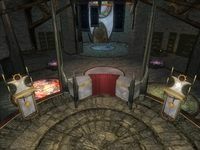 On an outside balcony, accessed from a door in the upstairs living area, you will find teleportation portals to all the Mages Guilds in Cyrodiil including the Arcane University. These portals will transport you to the first floor inside each Mages Guild. The trip is instantaneous in game-time, allowing much faster traveling to places throughout Cyrodiil. Be aware that there are no portals in the guild halls, so returning to Frostcrag Spire will require standard travel methods. Although horses do not technically use the portal, your current horse (if any) is transported to the destination city's stables at the same time. The Kvatch Mages Guild also has a portal, but it is inoperable, since that guild was destroyed. If you try to use the Kvatch portal, a message will appear saying: The Kvatch guild hall is no more. This altar is found in the main room on the first floor. In order to make it functional, you must first buy a box of Magetallow Candles and add them to the altar. It is then equivalent in function to any of the Altars of Spellmaking at the Arcane University. This altar is found in the main room on the first floor. In order to make it functional, you must first buy a box of Magetallow Candles and add them to the altar. It is then equivalent in function to any of the Altars of Enchanting at the Arcane University. This altar is found in the main room on the first floor. It allows you to summon a permanent companion atronach, who will listen to your commands. You can summon a Flame, Frost, or Storm Atronach, by sacrificing three Fire, Frost, or Void Salts, respectively. After purchasing the vault upgrade you will find two gravestones in the vault. They are located side by side, against the outer wall on the southwest side of the room. In that area there is a circular alcove containing a winerack and seven barrels. Exit from that alcove and continue clockwise around the vault; you will immediately come across a metal strut. Follow that strut to the outer wall and tucked into a corner between the wine alcove and the outer wall you will find the two gravestones. Lennasaan's Gravestone casts Lennasaan's Touch on you, which fortifies Personality by 10, Mercantile by 15, and Speechcraft by 15 all for 800 seconds. The second one is Rindsey's Gravestone. When you activate it you will receive a message about Rindsey: "Here lies Rindsey, acclaimed archer and celebrated aficionado of Tamrielic ales. We honor him for his bravery and for his famous Daedric Lava Whiskey discovered during his perilous expedition to Dagon's Realm." You then receive a single bottle of Daedric Lava Whiskey; reactivating the stone will not give you another. Do not miss the jewelry box! It is located in the living area on top of the small bookcase. You have to buy everything to get the jewelry box, including the candles. However, once you do, you'll be pleased to see the ring Pentamagic Loop. You can summon a creature using a spell in addition to the atronach summoned by the altar. This enables you to have two summoned creatures active at the same time, which is not otherwise possible. Casting a fire spell at the base or surrounding area of the hand by the front door will cause a weird effect and allow temporary glimpses of the rest of the hand's body: a large Frost Atronach buried in ice. Players with the download can utilize an exploitable glitch to permanently summon friendly Dremora Markynaz. Further details can be found on the Exploitable Glitches page. You can summon an atronach from the altar in the main hall. If you leave it waiting too long, it may become lost and then you will not be able to summon a new one or dismiss the old one, eliminating one of the benefits of this download. Most commonly it seems that this happens when you leave it waiting in the vault or in the first room. The atronach actually stays in Frostcrag Spire and is part of it; the problem is re-releasing it. This can also be fixed if you revert to an earlier save where you still have your lost atronach. Open the console and click on the atronach. The particular (and apparently randomly generated) reference id for your lost atronach will appear at the top of the screen. Go back to your new save and type player.moveto <refid>. It should take you right to it. If you get expelled from the Mages Guild while in the Anvil guildhall with Wizard's Tower active, you will be transported to the Anvil teleportation portal at Frostcrag Spire, instead of just outside the Anvil guildhall (as the destination portal in the guildhall added by the Wizard's Tower download wasn't set up properly). The atronachs are marked as quest items, and so will remain in place indefinitely if killed. The only way to remove their corpses is to load an earlier save. This bug is fixed by version 1 of the Unofficial Oblivion DLC Patches. The installation of the Fighter's Stronghold official download will cause problems when you try to buy the upgrades for this area. Read the Mystic Emporium bug section for more details. The items taken by the Atronach Altar can be subject to the Separate Stack Removal glitch. If you leave the tower before the large wall slides open it will be permanently closed for the rest of the game, unless you reload. ? This page was last modified on 6 November 2018, at 17:01.